1) Thigh cramps occur in the thigh muscle in the form of spasms or involuntary tightening movements.They can affect a large portion of the thigh muscle and can be extremely painful. Massaging the muscle quickly helps curb the pain. 2) Calf cramps are the most common form of night-time leg cramps and are quite painful. You often experience them when you lie in bed to sleep at night or early in the morning when you stretch your legs. Fortunately, massaging the muscle vigorously right away helps them pass faster. 1) Dehydration. When you don’t drink enough water or sweat a lot and don’t replenish lost liquids, your muscles suffer because of the resulting electrolyte imbalance and you get leg cramps. Sweating from intense physical exercise, having diarrhea, hot weather, forgetting to drink water during the day or drinking fizzy sodas instead of water all disrupt the normal electrolyte balance which regulates muscle activity, causing leg cramps. Most of the time, the cramps appear at night as a result of not drinking enough liquids throughout the day. 2) Diuretics. Diuretic medication (like hypertension diuretics) deplete the body of essential nutrients such as electrolytes and cause nutrient imbalances in the body that affect normal muscle function. If you have been prescribed diuretics for hypertension, heart failure, diabetes, kidney disease or other medical conditions, note that muscle cramps, pins and needles sensations or muscle aches are listed as adverse effects on the medical leaflet. Talk to your doctor about what you can do to minimize the side effects of diuretics. 3) Drinking too many fluids. Drinking too much water, herbal teas, juices etc. stimulates diuresis and this continual elimination of fluids from the body without replenishing vitamins and minerals that are lost along with the fluids and toxins filtered by the kidneys can result in leg cramps at night or anytime during the day. If you like to exercise or are an incredibly active person, but experience leg cramps after working out, consider sports drinks with electrolytes instead of drinking only water. 4) Alcohol consumption. Alcohol dehydrates and stimulates diuresis, causing the body to eliminate water and nutrients more rapidly than normal which can cause leg cramps. The more alcohol a person consumes, the more severe their nutritional deficiencies and the more frequent the leg cramps at night, along with other health problems. 5) Intense exercise. The reason why exercise causes leg cramps is because physical activity causes you to sweat intensively and become dehydrated. This, in turn, can result in painful leg cramps at night. However, experiencing leg cramp right after working out can also mean a muscle strain or other injury due to a too intense exercise routine, bad posture during exercise and improper use of gym equipment. Calf muscle cramps are more common in cyclists or anyone who uses a stationary bike at the gym. 6) Coffee and caffeinated beverages. Despite its benefits, coffee is a strong diuretic and causes dehydration whilst encouraging vitamin and especially mineral deficiencies. It also impairs nutrient absorption and the more coffee you drink, the more magnesium and potassium you lose, the caffeine causing you to experience leg cramps at night. 7) Vitamin and mineral deficiencies. Leg cramps are often a symptom of nutritional deficiencies. And the ones most likely to impact muscle health and cause muscle cramps at night are potassium, magnesium and vitamin B6 deficiency. Magnesium keeps the muscles themselves healthy while potassium regulates the transmission of electrical impulses from nerves coordinating muscle activity. A deficiency in vitamin B6 causes neuropathy with symptoms such as leg cramps. Calcium, vitamin A and vitamin E deficiencies can also contribute to muscle problems. So if you are not getting enough of these three nutrients from your diet or have increased requirements (caused by diarrhea, sweating, medication use, malabsorption problems, disease), you might just experience frequent leg cramps at night. 8) Leg cramps and pregnancy. Being pregnant can be a difficult time in your life and come with a rather strange symptom: leg cramps at night. There are a number of reasons leg cramps during pregnancy, but most have to do with nutritional deficiencies, growing nutritional requirements causing these deficiencies, hormonal changes and sacroiliac joint dysfunction caused by the normal weight gain during pregnancy. Leg cramps at night or in the morning during pregnancy occur both in the second and third trimester. 1) Include in your diet foods rich in magnesium (pumpkin seeds, sunflower seeds, nuts or spinach), potassium (bananas, potatoes, sweet potatoes), calcium (dairy in moderate amounts, green leaf vegetables, tofu, sardines, salmon and other fish), vitamin E (nuts and seeds, except if you are allergic) and vitamin A (liver, fish oil, sweet potatoes, carrots and orange foods). 2) Supplement with magnesium, potassium and B vitamins if needed. Talk to your doctor about the best dosage. 3) Improve circulation with the help of massages, hot showers, warm water bottles or infrared lamps (read more about the benefits of the infrared lamp). 4) Consider naturally sparkling water and sports drinks with electrolytes instead of plain water. Other cures for leg cramps at night explained. 1) Leg cramp tablets or supplements. These are often just dietary supplements containing, for the most part, vitamins, nutrients or extracts which often include magnesium, vitamin B6 and potassium for nerve health, sometimes amino acids or vitamin C and different plant extracts to cover joint health and improve mobility. 2) Leg cramps creams. These often contain natural extracts of anti-inflammatory herbs (example: mountain arnica or wolf’s bane) and are aimed more at joint health, but good for pain caused by muscle strains or other minor injuries as well. Conclusion. Whether you experience a mere twitching of the inner thigh, painful calf cramps or toe cramps that bend your toes tight, nighttime cramps should not be taken easily. It can be that your leg muscles are reacting to changes in temperature, signaling minor nutritional deficiencies or are overworked from the gym, but they may as well indicate more severe pathologies that are yet to be discovered. 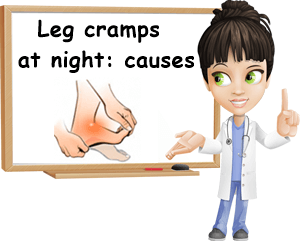 So if you frequently experience extremely painful leg cramps at night and the pain does not respond to any dietary changes, supplementation or natural cures as the ones listed above, see a doctor as soon as possible.